Displaying 1 to 32 (of 32 products)	order by Products Name. 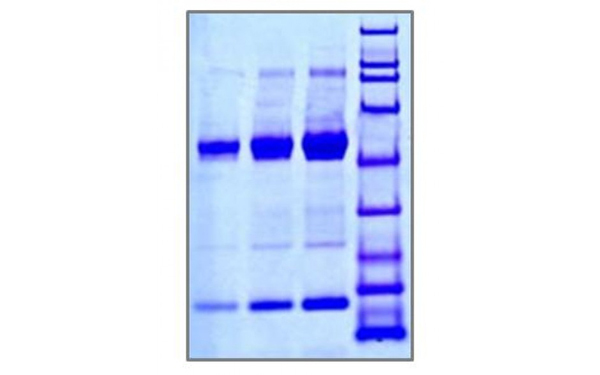 Highly pureEBV protein was purified by affinity chromatography. EBV Protein,Epstein Barr Virus Antigen Protein; EBV Cell Lysate. > 98% pureEGVEGF protein was purified using a a proprietary chromatographic technique. Purified using a proprietary chromatographic technique. Specific methodologies have not been tested using this product. Greater than 93.3% as determined by: (a) Analysis by RP-HPLC. (b) Analysis by SDS-PAGE. Greater than 98.0% as determined by (a) Analysis by RP-HPLC. (b) Analysis by SDS-PAGE. Greater than 95.0% as determined by RP-HPLC. Greater than 98.0% as determined by: (a) Analysis by RP-HPLC. (b) Analysis by SDS-PAGE. Greater than 99.0% as determined by (a) Analysis by RP-HPLC. (b) Analysis by SDS-PAGE. The extract has been manufactured from human epithelial cells grown in cell culture then digested using sodium dodecyl sulfate, phenylmethyl sulfonyl fluoride, and dithiothreitol. Chronically infected cells are harvested by centrifugation and disrupted by sonication and cell debris is removed by centrifugation. Greater than 99.0% as determined by: (a) Analysis by RP-HPLC. (b) Analysis by SDS-PAGE.